Los Angeles County is home to a wide variety of dockless, electric scooters, and it is also home to a wide variety of scooter injuries. 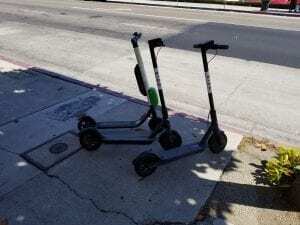 Bakersfield and Culver City have Bird, Long Beach has Razor, Uscooters, Spin, Lime and Bird, Santa Monica has Bird, Lime, Jump (Uber) and Lyft. Areas that do not have scooters will soon, other than Beverly Hills and West Hollywood. If you were seriously injured in a scooter accident and you feel that another person or scooter company was to blame, contact us for a free, confidential consultation and case evaluation. What is a serious scooter injury? A serious scooter injury may range from a bone fracture to an injury which puts you out of work for a significant amount of time. Serious injuries could also include the permanent loss of use of a body part, disfigurement, or an injury which prevents you from continuing your normal daily activities. Not all scooter accidents are someone else’s fault. If you hop onto a scooter and fall over because you haven’t ridden a scooter in 20 years, you’re probably not going to able to hold anyone accountable for the injury. There are, however, times when others are negligent and they contribute to or cause your crash. Dangerously defective or poorly maintained electric scooters (defective brakes, wheels and tires). So long as an electric scooter operator is in compliance with California traffic laws, he or she has the same right to the use of the roadway as any bicycle rider or motorist. If the driver of a motor vehicle causes an accident and injuries, he or she might be held liable for damages. If they’re not watching where they’re going, pedestrians might even be held liable for an electric scooter operator’s injuries, especially if the pedestrian’s eyes are glued to a phone screen. Even the State of California, a county or municipality might be held liable for an accident due to lack of proper road maintenance. If you’ve been injured in an electric scooter accident as an operator or a pedestrian, you can contact us to arrange for a free consultation and case evaluation. We’ll be pleased to give you our case analysis and answer your questions.